This is a Petite Sendero. It is thinner and slimmer than the normal one though the porportions are the same. 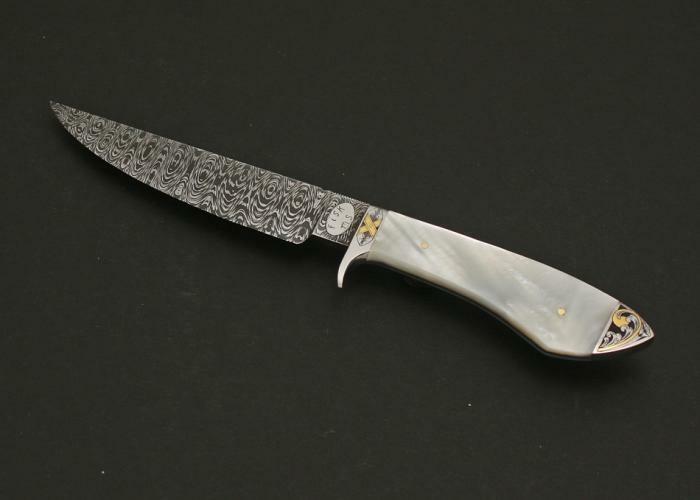 This particular knife won the "Best knife with Mother of Pearl" at the Arkansas Custom knife show in 2012. Search Similar Attributes: Mother of Pearl, Sendero, Engraving, Gold, W pattern, back bolsters. Embellishments: Deep relief engraving and gold on the guard and back bolsters.